My musical collaboration with Johnny Shitcase and Professor Bruce of Shitcase Cinema began in 2009. I don't recall the precise circumstances of our initial contact, but I think it had something to do with my search for Youtube footage of Donald Sutherland's notorious eye-roll scene in Virus, the sci-fi-horror flick of 1999, stumbling across a Shitcase Cinema review of the film in the process, and consequently watching a whole bunch of Shitcase. I absolutely love(d) their humorous, do-it-yourself approach to reviewing (mainly) bad movies, which showcased (and still features) John's well-written scripts and thick Yorkshire accent, Professor Bruce's "science" segments and role as comic foil, their silly over-the-top skits often involving a cast of characters such as Caveman Wayne, a heavy dose of Pythonesque absurdity, and (of course) a propensity for creative cursing. DOWNLOAD (alternate link in "comments"). This led me to contact Johnny Shitcase, and after some friendly back-and-forth messages, I offered (or agreed, I don't remember) to do some mashups of Professor Bruce's already perfect theme song with some soundtrack tunes. 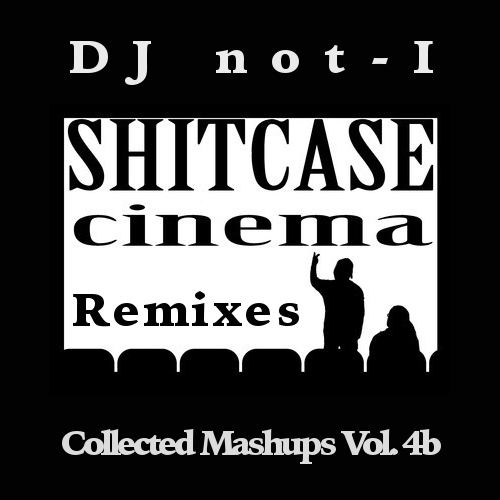 Over the course of the next couple years, I did a total of seven short Shitcase Cinema Theme Song mashups/remixes, six of which were featured in various Shitcase reviews. At some point, with the Google takeover of Youtube and its private message system, John going on a long trip overseas, and me having various other things on my plate, our collaboration petered out, so I thought I'd take this occasion to duly celebrate it with this collection. And what better way to introduce uninitiated not-I fans to Shitcase Cinema than with a series of Shitcase videos that feature my little remixes? (See end of post.) DOWNLOAD (alternate link in "comments"). Miix of tracks 1-7 with not-I shout-out. Produced by DJ not-I @ Mexikotrax, 2009-2011 (except 8, produced in 2014). For promotional use only! And now for some Shitcase Cinema (by the way, they have an official page and a very active group on Facebook. And here's my official Facebook page: DJ.not.I). Three more Shitcase Cinema reviews feat. not-I remixes after the jump!